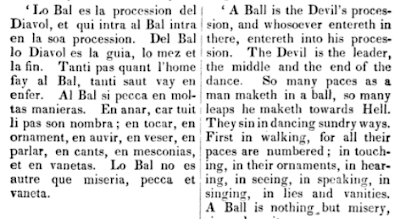 Luther on Dancing: "as many paces as the man takes in his dance, so many steps he takes towards hell"
“As many paces as the man takes in his dance, so many steps he takes toward Hell.”Quoted here. Crossing Martin off my next party-invitation list. I like to contrast Luther with John Locke who, in his thoughts on education, mentions dancing first as an essential element of a child’s formal instruction. My explication is here in Part 8 of my online Philosophy of Education course. We'll see that this is a gross historical misrepresentation. Luther probably didn't say it, nor did he take the severe position on dancing being attributed to him. In the year 1721, Thomas Lightfoot and I, with William Browne, went to a meeting at Bush-River, and going over Susquehannah-Ferry, the people were fiddling and dancing. When their dance was over, I asked them, believing them to be Protestants, If they thought Luther to be a good man? They replied, Yes, there was no doubt of it. "Well," said I, "and so do I; and I will tell you what he says concerning dancing, That as many paces as a man takes in his dance, so many steps he takes towards hell;" which spoiled their sport, and they went away, and we went on ours towards the meeting; and a good meeting it was! and we after it returned by way of Nottingham, and had a meeting there, and one at New-Garden, and so on to Philadelphia. I was from home about a week, and travelled in this journey about one hundred and fifty miles, and was well satisfied therein. A comparison of Chalkley's first-hand testimony and Fischer's recounting of it show blatant inconsistencies. First, Fischer provided a gross mis-citation to build his point, then he poisons the well in regard to an historical figure. David Hackett Fischer says this story is representative of Quaker attitudes towards children, particularly "teenage children... a party of young people who were dancing merrily together." The very source he cites (Chalkley) though says only, "the people were fiddling and dancing." "Teenage children" and "young people" were not explicitly mentioned by Chalkley. Notice also Fischer describes Chalkley as expressing "sadistic satisfaction." "Sadistic" is quite strong, and a rather unfair word describing Chalkley's motivations. He also maliciously refers to him as an "avenging angel." Further, Fischer's Chalkley stops the party by breaking in on them and demanding if they knew who Luther was. Chalkley though waits till their dance is over and then simply asks them a question. * La bal es la proces. del diavol, e qui intra en la bal, c.
t Sp. Alm. fol. 50-54. Jean Paul Perrin published his History of the Waldenses in 1624, and it went through many editions. His use of the quote can be found here. It's much more probable that Chalkley was quoting either Perrin or Penn and simply misattributed the quote to Luther. If the story is true, it certainly demonstrates that whomever this group of dancing people were, Luther's name commanded respect and authority, even if the person utilizing it was an unknown stranger proselytizing for the Quakers. An examination of this quote reveals a strong dose of Internet propaganda. First, what's presented is a poorly documented obfuscation not only from this particular philosopher, but also from the modern source this quote was taken from (David Hackett Fischer, Albion's Seed). Second, this quote is probably not from Luther. Even if Luther did say it somewhere, it pre-dates him as coming from at least the Waldensians, so he was either citing an earlier source or was himself borrowing it without attribution. Third, the Rockford University philosopher provided no meaningful documentation or argumentation that Luther's view of either dancing or education was inferior to John Locke. Luther certainly wrote about education, and these writings are readily available to anyone with access to a good college library. In fairness to the Albion's Seed reviewer and David Hackett Fischer, their point was not about Luther, but rather Quaker attitudes about children (even though the source they mis-cite doesn't say anything about children in the tale being reported). By the time the quote made it on to the radar of the Rockford University philosopher, what started out as a point about Quaker children became entirely about Luther, and also an opportunity for others in the comment box to say, "Yes, absolutely Luther was a repugnant figure" that "broke the chokehold of the Catholic Church over European society, triggering the long, often horrifically bloody chain of events that led to the secular liberalism of the Enlightenment." 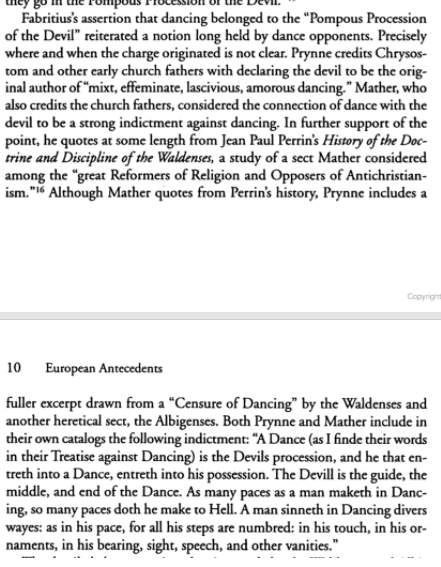 Luther is also contrasted with John Locke who held "dancing first as an essential element of a child’s formal instruction." A link is given to the philosopher's video presentation of the Locke / Luther comparison (his "explication"), but one has wait until part three to finally get to Locke's views on dancing. These videos appear to predate the discovery of the bogus Luther quote, so there is no contrasting of the two views done in the videos, only a brief presentation of Locke's position. There is no rational ground to cross Luther off the "party-invitation list." Rather, the quote and commentary are typical of Internet propaganda and ignorance, this time not perpetuated by someone posting anonymously on a discussion forum, but rather by someone with a Ph.D in philosophy. I looked up the documentation you provided for the quote. The documentation you gave is to a review of the book, Albion’s Seed. The author of that book (David Hackett Fischer) cites the quote via the Journal of Thomas Chalkley (1675-1741). Chalkley doesn’t cite a source, and appears to be in error in attributing the quote to Luther. Versions of the quote pre-date Luther. Further, David Hackett Fischer not only mis-cited Chalkley at this point in his book in regard to the story in which this Luther quote appears, he also engaged in a blatant poisoning of the well in regard to the character of Chalkley. I would hold off on crossing Luther off your next party list. Luther was not a Quaker like Chalkley. Luther was not against the concept of dancing, but rather inappropriate dancing. Luther loved to have a drink, had rather colorful (and at times crude) language, had a sense of humor, could tell a story, and was otherwise beloved by family and friends with a larger-than-life personality. Of course, Luther had serious flaws as well, including his anti-Semitism, but so did the bulk of 16th Century western culture. I’m sure we could also scrutinize John Locke and find reasons to scratch him off the party list as well, for as clear of thinker Locke was, I’m sure we could find ways in which he was infected by the culture of his day, for instance, slavery. Thanks for the follow-up research, James. Luther himself recognized the devastating effects of such admittedly insincere preaching: “The Gospel today finds adherents who are convinced that there is nothing except a doctrine that serves to fill their bellies and give free reign to all their impulses” (Werke, 33, p. 2, in ibid., p. 212). This is one of those quotes that I categorically classify as "Did Luther Regret the Reformation?" They are typically posted by those dedicated to defending the Roman church. Historically, such "shock" quotes served as propaganda used by pre-1930 Roman Catholic controversialists. Those writers put forth the conclusion that the Reformation was a failure: it didn't produce any real fruit, and Luther's own words and the state of Protestantism at the time prove it. The argument goes: Protestantism isn't a movement of the church. It is the result of heresy, and heresy never leads anyone to true holiness. Then statements are typically brought forth from Luther's career, indicting him of regret for starting the Reformation. Most of these pre-1930 books had fallen into obscurity, but with the arrival of the information explosion brought forth by the Internet, these quotes made a comeback. It's not at all uncommon to visit discussion forums like Catholic Answers and find these "regret" quotes taking center-stage. Let's take a look at this quote and see if Luther was really admitting to the "devastating effects" of his "insincere preaching." I do question the validity of this testimony of learning, especially the claim of reading Luther's writings and the ability to read primary sources to form opinions. Of the two posts of Luther material this person presented in this discussion (#1, #2), neither demonstrates a straight reading of Luther. The material was probably taken from a few web-pages, then cut-and pasted over on to the Catholic Answers discussion forum. I suspect this page, this page, and perhaps this page was utilized. Unless the person posting this material on Catholic Answers wrote these links, much of the content presented is blatant plagiarism. For this quote particularly, this web-page appears to be that which was plagiarized. Even if he (she?) did compose this web page (or one of the others), I still doubt any of the material came from a straight reading (or "studying") of the "primary sources" for Luther. Some of what was posted was directly plagiarized from Father Patrick O'Hare's, The Facts about Luther. This quote appears to have been plagiarized from this webpage that presents an article written by Plinio Corrêa de Oliveira entitled, Luther Thought He Was Divine! It appears the article was "originally published in the Folha de S.Paulo, on January 10, 1984," so it's probable that the article was not originally in English. 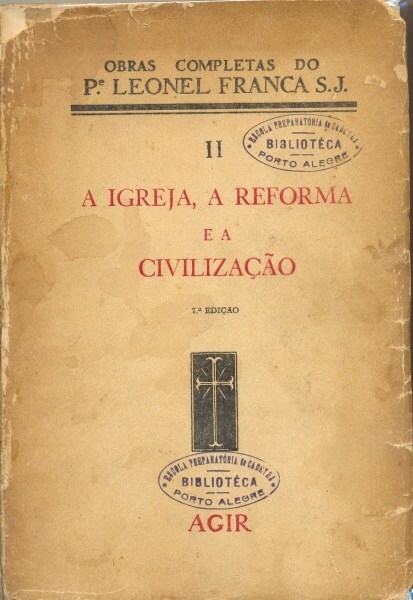 This version provides information about the author, and we can safely rule out the person at Catholic Answers being Plinio Corrêa de Oliveira: he died in 1992. The original article presents the quote in the exact form with one exception: the documentation. The Catholic Answers participant provided, "Werke, 33, p. 2, in ibid., p. 212." Some versions of the article say rather, " Werke, XXXIII, p. 2; Franca, p. 440." I did locate a Portuguese version of the article that uses "'Werke', ed. de Weimar, 33, p. 2 – cfr. po. cit., p. 212" on the Plinio Corrêa de Oliveira website along with an English version using p. 440. Whatever page is meant, the confusion seems to be with whoever originally translated de Oliveira's article. 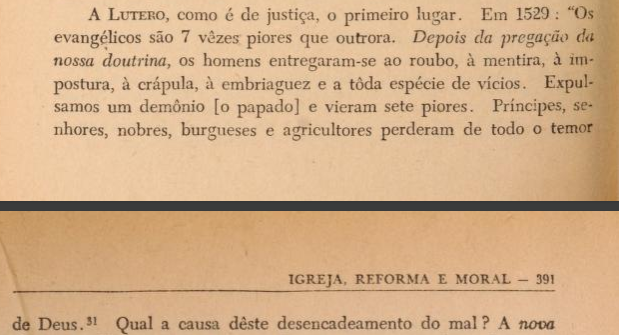 The sentence in question reads, "Evangelho hoje em dia encontra aderentes que se persuadem não ser ele senão uma doutrina que serve para encher o ventre e dar larga a todos os caprichos." with the documentation, "Weimar, XXXIII, 2." It appears that the English version floating around the Internet was de Oliveira's translation of Franca's Portuguese (and that Portuguese was perhaps a translation of German sources). I'm not sure if Franca mined this quote himself, or took it from Denifle, Döllinger, or some other earlier source. He cites a number of pre-1930 Roman Catholic controversialists throughout his book. This text is from Luther's sermon / commentary on John 6:26. It has been translated into English. The quote in question can be found in LW 23:5. Luther preached on John 6-8 between November 5, 1530 and March 9, 1532 (LW 23:5). Since our Head, Christ the Lord, experienced this, why should we complain if we have disciples who allege that Christ came into the world solely for the sake of our physical well-being? The day will come when Christ will punish such disciples, saying: “This is not what is meant. I preach about a spiritual eating, about spiritual food; I seek the glory of God.” Since He does not confirm them in their idolatrous devotion but upholds the honor of God, His preaching falls on deaf ears. And we fare the same way today (LW 23:7). Well, a preacher must derive what comfort he can from the fact that sows and dogs will be among the hearers wherever the Gospel is preached; it will not be otherwise. These seek nothing else in the Gospel than their own gratification. And if you have this experience, why do you grieve over it so? You are no better than the Lord Christ. If this is the way He fared, you cannot expect to fare differently. There will come a day of reckoning (LW 23:8). There is nothing in the context of this sermon in which "Luther himself recognized the devastating effects of such admittedly insincere preaching." The context demonstrates rather that Luther was well aware that just as people followed Christ for the wrong reasons in the first century, so also in the sixteenth century. I highly doubt that Plinio Corrêa de Oliveira, Fr. Leonel Franca, and even the person over on the Catholic Answers discussion forum would be willing to follow their argument to its logical conclusion: If Luther's preaching was "insincere" because some people took the Gospel message to "fill their bellies and give free reign to all their impulses," so also did the ministry of Jesus attract some of the same kind of people. Luther: As for his evangelical followers, Luther added that “they are seven times worse than they were before." became severely morally bankrupt ("seven times worse") due to his influence. And Luther added, regarding his evangelical henchmen, that “they are seven times worse than they were before. After the preaching of our doctrine men have given themselves up to robbery, lying, imposture, debauchery, drunkenness, and every kind of vice. We have expelled one devil (the papacy), and seven worse ones have come in” (Werke, XXVIII, p. 763; Franca, p. 441). Notice the opening begins with the inflammatory, "And Luther added, regarding his evangelical henchmen.." rather than "As for his evangelical followers.." There are some other minor word variances as well ( "robbery" "imposture"). There's also some confusion in the documentation. Some of the versions say "in ibid., p. 440" others say "Franca, p. 441." I did locate a Portuguese version of the article that uses p. 440 (on the Plinio Corrêa de Oliveira website) along with an English version using p. 440. The text being cited is from Luther's comments on Deuteronomy 9:25 from a 1529 sermon. It can also be found in Walch III, 2727.To my knowledge, the complete context this paragraph comes from has yet to be translated into an official English version of Luther's Works. Some years back I came across an English translation of paragraph 49 from Walch III, 2727. This is an oft-used obscure Luther quote. I've gone over it a number of times. Rome's defenders seem to think that Luther was so deluded that he continued to preach the gospel for decades, without any positive results. In their minds, this must be a telling sign that Luther proclaimed a false gospel. In actuality, Luther consistently held that the gospel would find great opposition, and would be attacked from all sides, including within. The gospel would be used by the world as a licence to sin and all sorts of evil because of Satan. The gospel would indeed make those of the world worse. There would also be false converts and people that followed the gospel for the wrong reasons. Luther was well aware that just as people followed Christ for the wrong reasons in the first century, so to in the sixteenth century. Luther wasn't postmillennial. While he was discouraged that the world seemed to be getting worse, his eschatological expectation can be traced back even to the early days of his Reformation work. For Luther, it was the end of the world. Things were indeed going to get worse. The Gospel was going to be fought against by the Devil with all his might. The true church was a tiny flock in a battle against the world, the flesh, and the Devil. He hoped the people would improve with the preaching of the Gospel, he often admitted he knew things were going to get worse because of the Gospel. It's one thing to argue Luther suffered from depression or had a despondency over the state of things, it's quite another to use his words to prove he had a sense of "failure and guilt" over the preaching of the Gospel, or that he was in agony over the Gospel going forth into the world and the trouble he admitted and expected it would cause. There are plenty of Luther’s works which demonstrate vile language and an unbalanced mind. This unflattering description of Luther and subsequent quote were not directed to "anti-Catholic" Protestants, but rather to a retired ecumenically-minded Roman Catholic priest participating on the Catholic Answers Forums. This ecumenist had previously described those who vilify Luther as "Catholics of a certain sort who cling to lore that has been rejected and discarded in the modern era." Such interactions are a revealing display of the disunity existing within Roman Catholicism in regard to Luther, the Reformation, and Protestants in general. This retired priest is in the minority on the Catholic Answers forums, for anti-Luther sentiment runs high. It's no wonder that Catholic Answer recently added the following: "DISCLAIMER: The views and opinions expressed in these forums do not necessarily reflect those of Catholic Answers." While I've addressed Luther's quotes about "reason" previously, let's take a fresh look at the quote presented by one of Rome's defenders. Do Luther's comments about reason "demonstrate vile language and an unbalanced mind"? We'll see that in context, they absolutely do not. They demonstrate that in Luther's theology, reason was not rejected outright, it was to be subject to and ruled by faith. This mythical, mentally unbalanced, diseased character was the hero of the Reformation. His intemperance, his persecution mania, his varying moods, were the origin of his permanent contradictions. There was nothing reasonable in him. Indeed, he admitted himself that he hated reason, and that he was guided merely by his passions, by his violent temper. More than once he condemned in his violent language, reason and a reasonable approach to matters. “Reason is the Devil's greatest whore; by nature and an manner of being she is a noxious whore; she is a prostitute, the Devil's appointed whore; whore eaten by scab and leprosy who ought to be trodden under foot and destroyed, she and her wisdom. . . . Throw dung in her face to make her ugly. She is and she ought to be drowned in baptism. . . . She would deserve, the wretch, to be banished to the filthiest place in the house, to the closets” (E16, 142-148). There are many more sayings in the same sense, though not always so dirtily phrased. “Usury, drunkenness, adultery—these crimes are self-evident and the world knows that they are sinful; but that bride of the Devil, `Reason', stalks abroad, the fair courtesan, and wishes to be considered wise, and thinks that whatever she says comes from the Holy Ghost. She is the most dangerous harlot the Devil has.” “Reason is contrary to faith”, he writes elsewhere. “Reason is the whore of the Devil. It can only blaspheme and dishonour everything God has said or done” (E29, 241) So it goes on and on (Wiener, p. 26). 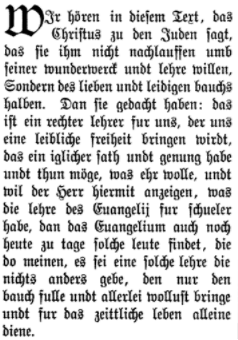 It does not necessarily follow that simply because Wiener provides a few references, he actually read Luther and mined these quotes out from E16 and E29. Wiener notoriously used hostile secondary sources. Wiener's documentation is highly dubious (He says the reason for his sloppy documentation was the rush job demanded by his publisher). Notice that even for the first quote, it is purported to span 6 pages (142-148). That's a good indication that it's a cobbled together quote from different pages or even different sources. In other words, if you were to search out "E16" you would not find this quote verbatim. You'd have to search for each line by starting on page 142 and work through the text with a highlighter. The second part of the quote, ("Throw dung at her and make her ugly") can be found on page 145 ("wirf ihr ein Dreck ins Angesicht, auf daß sie häßlich werde"). So there's a fair amount of text between these two sentences (approximately five paragraphs!). These pages are excerpts from the Last Sermon in Wittenberg Luther preached, January 17, 1546. The sermon can be found in WA 51:123-134 and CL 7:411-417. WA includes the German as well as the German / Latin mix. This sermon has been translated into English: LW 51:371-380. The sermon is based on Romans 12:3, "For by the grace given to me I bid every one among you not to think of himself more highly than he ought to think, but to think with sober judgment, each according to the measure of faith which God has assigned him." One of Luther's main thrusts is to exhort his hearers to live by the pure Word of God, letting it say what it says without trying to use "reason" to make it palatable. But since we are still confined to this miserable carcass—which in time the worms will devour, though it deserves something worse, to burn in hell eternally—it is necessary constantly to resist and put off the old man and his works and put on the new man, which is being renewed in knowledge after the image of him that created him [cf. Col. 3:10]. Usury, gluttony, adultery, manslaughter, murder, etc., these can be seen and the world understands that these are sins. But the devil’s bride, reason, the lovely whore comes in and wants to be wise, and what she says, she thinks, is the Holy Spirit. Who can be of any help then? Neither jurist, physician, nor king, nor emperor; for she is the foremost whore the devil has. The other gross sins can be seen, but nobody can control reason. It walks about, cooks up fanaticism [Schwärmerei] with baptism and the Lord’s Supper, and claims that everything that pops into its head and the devil puts into its heart is the Holy Spirit. Therefore Paul says: As I am an apostle and God has given me the Spirit, so I appeal to you [of. Rom. 12:1; 1 Cor. 4:16] (LW 51: 373-374). Therefore I should stick to the catechism; then I can defend myself against reason when the Anabaptists say, “Baptism is water; how can water do such great things? Pigs and cows drink it. The Spirit must do it.” Don’t you hear, you mangy, leprous whore, you holy reason, what the Scripture says, “Listen to him,” who says, “Go and baptize all nations” [Matt. 28:19], and “He who believes and is baptized [will be saved”]? [Mark 16:16]. It is not merely water, but baptism given in the name of the holy Trinity. Luther didn't reject reason. Rather, it was to be subject to and ruled by faith. For instance, this sentiment is usually left out when the quote in question is cut-and pasted: "Everything should be subject to faith, or rather, the fine gift of conceit should not be wiser than faith. See to it that it is in accord with it" [LW 51:379], "Reason must be subject and obedient to this faith"[LW 51:379]. Above I chose only to provide a few of the relevant paragraphs from the sermon. The entire context is worth reading to grasp fully what Luther preached. For the first line of the quote, "the devil’s bride, reason, the lovely whore," reason is that which informs a man that particular theological interpretations are not sin. Luther had in mind the fanatics and their interpretation of the Lord's Supper and baptism. This same thought applies to "Throw dirt in her face and make her ugly." Luther is preaching against the views of the sacramentarians in regard to their "reasonable" interpretations of the Lord's Supper and baptism. LW translates the word "dreck" as "dirt," Wiener (or whomever he took the quote from) translated it as "dung." Both uses are feasible. Luther's intent was probably the later. Luther goes on to say, "I wish they had to eat their own dirt." It appears LW cleaned up the translation! Because many of Rome's defenders don't bother looking stuff up before they post it, they end up missing the fact that Luther was actually arguing for the literal body and blood of Christ in the Lord's Supper, and arguing against those who rejected this. But then again, Luther says in the same sermon that "reason" left unchecked thinks that Mary, "the holy mother of Christ" should be honored and is also an intercessor, "That’s the kind of thing this comely bride, the wisdom of reason cooks up: Mary is the mother of Christ, surely Christ will listen to her" (LW 51:375).